Diners frequently ask chefs to share culinary secrets of their favorite dishes, including ingredients in gourmet burger recipes. The tantalizing tastes are traceable to the toppings, the burger seasonings or a combination of the two. Burgers date back to the 15th century. Until the mid-20th century, a burger was almost exclusively made of ground beef, although the common moniker of hamburger would indicate pork was the main ingredient. The word hamburger actually refers to the city of Hamburg, Germany. When German sailors landed in New York in the late 18th century, street vendors reportedly lured their business by recreating sandwiches of salted, minced beef on buns that were popular in Hamburg. Today, the word burger generally refers to any patty made of ground meat, fish or seafood, poultry or, in some cases, vegetables or protein-rich meat substitutes. Even the traditional bun of the old-fashioned burger is no longer necessary to fall into the burger category. 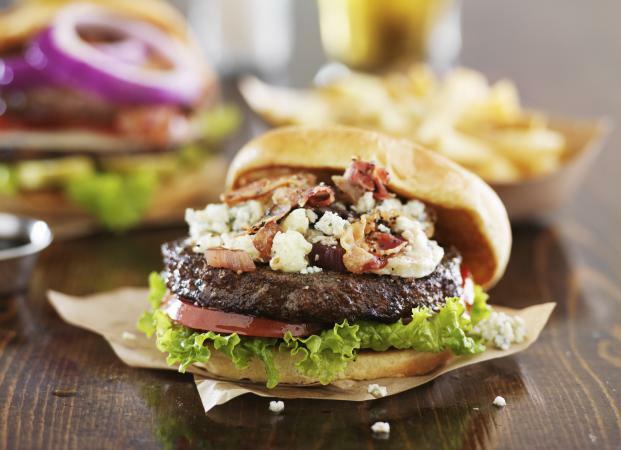 Whether you choose to use a gourmet burger recipe to dress up an old standby like a bacon cheeseburger, go Greek with ground lamb seasoned with fresh mint and served in pita bread, dress up a pork patty or go the salmon burger route, gourmet burgers are distinctive sandwiches you won't find at any drive-thru burger joint. This recipe transforms a long-time favorite into a feast for the eyes and palate. Topped with aged teleme, Camembert or Brie, an arugula fig mixture, bacon and lemon-grilled fennel, this burger is sure to please guests. Don't be intimidated by all the steps and ingredients; your taste buds will appreciate all the extra effort. In a kettle style grill with a lid, build a fire to cook over direct heat; the indirect method with coals on either side will not get hot enough to cook the burgers. Let the coals burn until they have a light white coating on them, about 15 minutes. If using a gas grill, set it to the medium-high setting. Lightly combine all the patty ingredients in a mixing bowl. To avoid compaction of the ingredients, do not over mix; overmixed patties will not be as juicy. Mold the meat into six equal size patties. Cover the bowl and set the mixture aside while preparing the toppings. Using a Microplane zester or other fine toothed grater/zester, grate two teaspoons zest from the rinds of the lemons, taking care not to grate any of the bitter white pith. After zesting, cut the lemons in half and squeeze about two tablespoons juice from them. Slice the fennel bulbs into thin rings, season with salt and toss with oil and lemon juice until lightly coated. Place the fennel in a grlling basket and cook over the hot coals until lightly charred and soft enough to pierce with a fork, about 10 to 12 minutes, occasionally turning and shaking the basket. After removing the fennel from the grill, toss it with the zest and wrap it loosely in foil to keep it warm. Cook the bacon in a fireproof skillet on the grill until crisp, turning frequently. Discard the bacon fat, wipe the skillet clean with paper towels and return it to the grill. Toast the chopped walnuts until golden, about one to two minutes, stirring frequently to avoid over browning. Whisk the oil and vinegar together to form an emulsion and add salt to taste. Mix the figs, arugula, and toasted walnuts. Thoroughly oil the grid of the grill, making sure it is free of residue to prevent the burgers from sticking. Arrange the hamburger patties on the grill and place the cover on top. For medium burgers, cook for five to seven minutes on each side, turning once. A minute or two before the burgers are done, top each one with a slice of cheese. While the cheese melts, lightly toast the insides of the buns on the outer edges of the grill. Divide the grilled fennel among the six bun bottoms and top each with a burger, bacon and fig-arugula mixture. Place the bun tops on the sandwiches and serve. Before you start slicing onions and tomatoes for your next burger meal, take a quick tour of your refrigerator and cupboard for inspiration. Just about any condiment or vegetable, whether fresh, pickled or canned, can transform a ho-hum burger into a sandwich masterpiece.